My big girl starts school tomorrow and it's all systems go around here. We've been gathering supplies and books and labels and have been debating with friends the merits (or lack thereof) of my old nemesis - contact. I find it literally impossible to cover an exercise book or text book without a random bubble, which shouldn't really bother me, but - you know. Luckily I spotted these beautifully-covered school books on Instagram the other day. I got in touch with Kara from Lulu Lucky in Brisbane to find out how she managed to avoid the dreaded contact and create something inspiring and stylish for school. Kara designed the covers herself using Word and then printed them at Officeworks large-scale (A2). Each of the designs uses the same colour palette (black and white) with different fun patterns and an area for her son's name, class and subject. After covering the books with the paper, she slipped each book into a clear non-adhesive plastic cover to protect them from wear and tear. Ezibooks (also in Brisbane) has a selection of clear reusable covers that would work a treat. You can also use the front cover design to slip into the clear front insert of a binder. Voila! 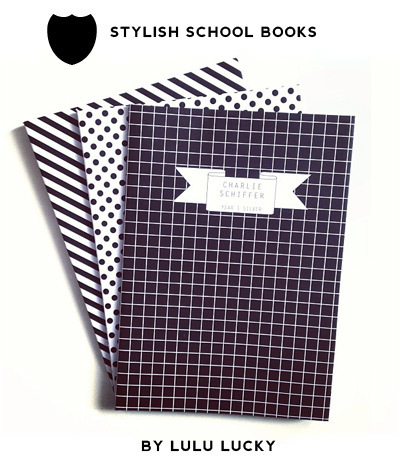 Stylish, cool school books with reusable covers and nary a bubble in sight. Thanks Kara for sharing!